The poster boy of the far-right in Britain would not be so prominent if it were not for radical free-market agitators on the extreme right in America providing support for his UK activities, which is ultimately designed to stoke up social division and tension for a specific political outcome. By all accounts, it appears that Tommy Robinson has been served papers with legal papers over claims he made about a teen Syrian refugee who was then allegedly bullied at school. The far-right mouthpiece, whose real name is Stephen Yaxley-Lennon, could face a defamation suit over videos and Facebook posts he made about the 15-year-old. Amid prominent media coverage, Robinson posted a series of videos on his Facebook account accusing the boy of bullying and claiming “lots of Muslim gangs are beating up white English kids” in Britain. Members of the public donated well over £10,000 for legal action against the anti-Islam activist after he posted a series of videos and Facebook posts about the incident in October. The legal papers were served only a week or so after Robinson’s Facebook page and other social media accounts were taken down. But how did Robinson go from career criminal and local loudmouth to international right-wing poster boy? Of course, you need to follow the money. It would be wrong to think that Robinson’s right-wing appearances, website and other communication outlets are funded by British people of a like mind – because while that may be true – it is only true to a certain extent. He is receiving financial, political and moral support from a broad array of non-British groups and individuals, including a number of right-wing US think tanks according to a Guardian investigation. In that investigation, Robinson has been found to have received funding from a US tech billionaire and a think tank based in Philadelphia. Then there are two other US think tanks, part-funded by some of the biggest names in rightwing funding. They have published a succession of articles in support of Robinson, who has since become something of a cause célèbre among the American far right since he was jailed last May for two months. Analysis conducted for the Guardian by the London-based Institute for Strategic Dialogue found that more than 40% of the tweets came from the US, 30% from the UK and the balance from a mix of other countries, putting the US, not the UK as his biggest followers. And prior to Facebook closing Robinson’s page he had more than 1 million followers, many from at least a dozen countries outside the UK, notably the US. And to give some idea of the ideology of the source of funding – the MEF received $792,000 from a foundation led by Nina Rosenwald, the co-chair of American Securities Management, once dubbed “the sugar mama of anti-Muslim hate”. To make matters even worse, the Gatestone Institute has received more than $2m in donations, including $250,000 from the Mercer Family Foundation, which is funded by Donald Trump’s top donor, Robert Mercer, and run by the billionaire’s daughter Rebekah. This is the very same group involved in the Brexit scandal that used known military tactics and strategies on the civilian population of Britain in the EU referendum. Now familiar names like SCL elections, Cambridge Analytica and of course Facebook are implicated. The police and National Crime Agency along with the Electoral Commission are involved. These very same organisations, typically fronted by think tanks and charities have been repeatedly accused of stoking anti-Islam sentiment in the west and spreading false information about Muslim refugees in Europe. And of course, their support for Robinson is very clear. That is factually incorrect on all accounts. It was the very same Pipes that created the fake news story (HERE) about “no-go” zones in predominantly Muslim areas in Europe. The MEF then spent a five-figure sum on Tommy Robinson’s legal defence. It also confirmed that it is aware of up to four other similar organisations were bankrolling a high-profile campaign aimed at supporting him and securing his release. MEF also confirmed it is funding Robinsons’s organising of London rallies and additional political lobbying. Robinson’s following on social media has also surged and he has been publicly supported by figures including the US president’s son, Donald Trump Jr.
More American intervention into Britain’s political dialogue is seen where the news of Robinson’s imprisonment last May generated a surge of pro-Robinson tweets. Analysis of 2.2m #freetommy tweets showed 42% came from the US, according to research by the Institute for Strategic Dialogue. The aims of these American right-wing free-market jihadists is simple. They are using any opportunity they can to amplify political divisions in the UK. We should also not forget that far right terrorism is a “growing threat” in Britain according to the Metropolitan Police’s outgoing Assistant Commissioner Mark Rowley. Four foiled terror plots in 2017 (28%) were categorised as far right, compared to ten foiled Islamist plots. John Meighan, the 33-year-old founder of far-right Football Lads’ Alliance, a supporter of Robinson, was embroiled in a closed FLA Facebook group that came under fire for hosting comments that included calls for Sadiq Khan, London’s first Muslim mayor, to be “hanged”, and a graphic cartoon depicting Diane Abbott and Jeremy Corbyn. American right-wing media outlets including Fox News, Breitbart regularly feature as Robinson’s supporters along with American actress Roseanne Barr, and internet personalities associated with the American alt-right. Britain dominates the top ten list of leading far-right influencers according to a new report by Hope Not Hate, with much of their success being driven by followers outside the UK, especially the USA. 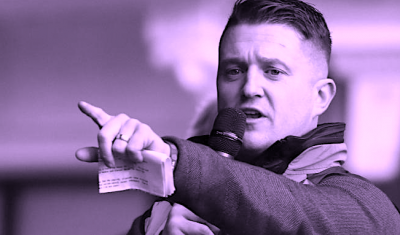 Tommy Robinson is now classified by this report and another study as one of the top five far-right figures in the western world. Heidi Beirich, deputy director of the Southern Poverty Law Centre, which monitors hate groups across the US, said the level of support for Robinson is “extraordinary”. It would be easy to forget amongst all the furore and media coverage surrounding Robinson that he did a stint in prison for mortgage fraud and was sentenced for assault, again for assaulting a police officer, for leading a punch up at a football match that almost turned into a riot, for using a false identity with a false passport and lastly convicted twice for contempt of court (source). In short, we should be very wary of American intervention into British culture. They have been found to have extensively funded and influenced the result of the EU referendum. They have been found to be infiltrating public life and intervening in Britain’s political discourse and caught red-handed in open warfare against Britain’s moderate way of life.